Taro has been a staple of the Polynesian diet for over one thousand years. The heart-shaped leaves, called lu'au, were the inspiration for the Hawaiian celebration of the same name. You cannot eat taro in raw form because its high calcium oxalate content makes it toxic. As a starchy vegetable, cooked taro is often used as a substitute for the potato. 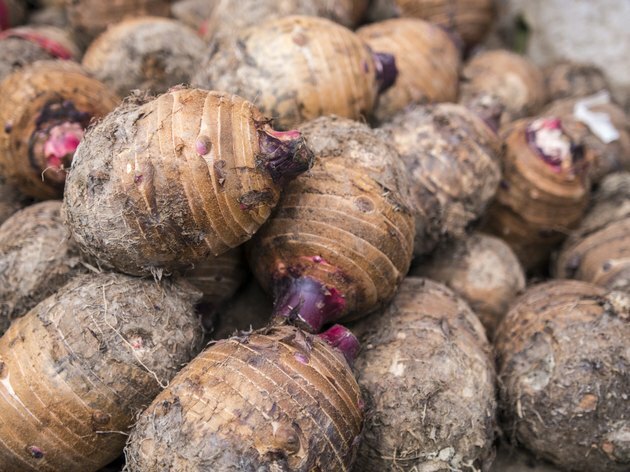 Like other tubers, it is not only high in potassium and fiber, but also contains a significant amount of vitamin E, making the taro a healthy food to add to your diet. Fiber is an essential nutrient that offers a number of health benefits including reducing your risk of cardiovascular disease, helping you manage your weight and improving bowel movements. Most Americans consume about 15 g of fiber a day, according to the American Dietetic Association, but need 25 to 30 g a day. A 1-cup serving of cooked taro contains 6.7 g of fiber, meeting approximately 25 percent of your daily fiber needs. Cooked taro is also high in vitamin E with 3.87 mg in a 1-cup serving. Vitamin E is a fat-soluble vitamin best known for its antioxidant activity, protecting cells from oxidation by free radicals. Including foods rich in antioxidants may offer protection against heart disease and certain types of cancer. Adults need 15 mg of vitamin E a day. A 1-cup serving of cooked taro meets 25 percent of your daily vitamin E needs. A 1-cup serving of cooked taro contains 639 mg of potassium. When included as part of a healthy diet, foods high in potassium can help control blood pressure. A healthy diet should include 4,700 mg of potassium a day, according to the American Heart Association. One serving of cooked taro meets 13 percent of your daily potassium needs. You should talk to your doctor before increasing the potassium in your diet. As you get older, the kidneys cannot remove potassium from your blood as efficiently as when you were younger. High levels of blood potassium can be dangerous. Including taro in your diet can help you meet your magnesium needs. A 1-cup serving of cooked taro contains 40 mg of magnesium. Magnesium is needed for bone health, muscle and nerve function and immune health. It also helps keep your blood pressure normal and regulates your blood sugar. Adult men need 400 to 420 mg of magnesium a day, and adult women need 310 to 320 mg a day. One serving of taro meets 10 percent of the daily value for magnesium. Are Boiled Sweet Plantains Healthy?